Autograph authentication services exist to assist buyers of autographed material - to help separate authentically signed items from the many non-authentic signatures that appear in the marketplace. The autograph marketplace is huge - including; online auctions, baseball card shows, hobby publications, retail stores, and auction houses. Within this vast marketplace are both authentic and non-authentic signatures. There has been much speculation bantered about in the media regarding the percentage of all autographs in the market being non-authentic. Some have claimed as many as 80% of all autographs being sold are not-authentic. While non-authentic autographs are a big problem, FHA does not believe the number is anywhere near 80%. However, it would very difficult to try to come up with an accurate number. The difference between authentic and not-authentic is huge, as non-authentic signatures have zero value. Nobody wants to spend good money on something that is worthless. Since the average collector or buyer of autographed material is not an expert on the signatures of the names they buy, they rely on the assistance of authentication services to help ensure that they are buying the real thing. With the enormous amount of non-authentic autographed material in the marketplace, it is a minefield, therefore, not surprising that more and more buyers are seeking guidance from autograph authentication services. 1. FORGERIES - The most commonly seen and most troublesome type of non-authentic signatures in circulation - whereby someone forges the signature of a celebrity on a particular item, then places it for sale in the marketplace. Forgeries are done by unscrupulous people with intent to defraud for the sole purpose of making quick and easy money. If someone is able to successfully slip forgeries into the marketplace, they can potentially make thousands of dollars for a few minutes �work.� The easiest money in the world if they can get away with it. Most forgers never get caught and the ones that do face a very weak legal system. It is, therefore, not surprising that many are drawn to engaging in this illegal activity. Most forgers are familiar with the authentic signature of the subject they are forging. Their goal is to make their forgery look as close as possible to the real thing. While some forgers are better at their craft than others, they all make mistakes. The job of the authenticator is to spot those mistakes. When it comes to authentication, close only counts in horseshoes. 2. SECRETARIAL or �GHOST SIGNED� items - Usually associated with autograph requests made via the mail, in which the celebrity had someone else sign for them. Many autograph collectors over the years have used the mail to obtain signatures of celebrities. In doing so, they were able to build a nice collection of authentic autographs, but were unaware if they received an item that was Secretarial or �Ghost-Signed.� While many celebrities over the years have responded to mail requests with authentic signatures, others took a different route. Some celebrities do not want to take the time to personally sign items sent to them, but feel an obligation to return them. So they have someone else, such as a secretary or relative sign for them. In some cases, the signers of such items try to make the signature appear like the true signature of the person they are signing for. More often than not, however, no such attempt was made, and these signatures are not even close to real thing. Another cause of Ghost-Signed items is when mail intended for the subject was never actually received by them (they could have been living elsewhere or the sender used an incorrect address) and someone else at that address signed and returned the items. Inevitably, Secretarial/Ghost-Signed items find their way into the marketplace at some point, and it is the job of the authenticator to spot and identify them as such. In these cases, the item upon which the signature appears can be an original, though the signature was actually signed by someone other than the name that appears on it. 3. AUTOPENS, RUBBER STAMPS & PRE-PRINTS - These are various mechanically produced forms of reproductions of someone�s signature. Like Secretarial/Ghost-Signed items, these are commonly seen in autograph requests made via the mail, where the celebrity did not want to take the time to hand-sign the items and sent back reproductions of their signature instead. 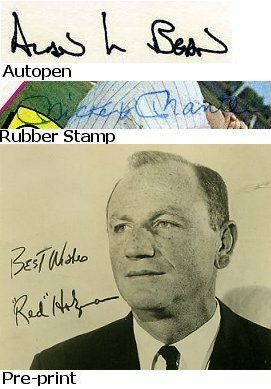 In both cases, many of these were done well before the recent increase in the popularity of autograph collecting, and the celebrity intended no harm. This deception, however well-intended, has resulted in many non-authentic signatures in the marketplace. In hindsight, it would have been much better had the celebrity simply returned items unsigned. Now, it is the job of the authenticator to identify these mechanically reproduced signatures. Like is the case with Secretarial/Ghost-Signed Items, the items upon which the signature appears can be an original, yet contain a mechanically reproduced copy of a signature. 4. COUNTERFEITS - Yet another form of non-authentic signature that plagues this field is counterfeits. Counterfeits are high quality reproductions of an original item and signature. For example, someone takes an original 8x10 photo which contains an original signature, then makes a high quality reproduction of it, then sells it as authentic. In this case, both the item and the signature are reproductions and not authentic. Items which are the easiest/most likely to be counterfeited are flat items, such as photos, cards, etc. All autographed items are either authentic or not-authentic. However, when determining authenticity, there are three possible conclusions: (1) AUTHENTIC; (2) NOT-AUTHENTIC; and (3) INCONCLUSIVE. Technically speaking, unless someone was there and witnessed the item being signed, they cannot say with 100% certainty that an autograph is authentic or not-authentic. In practical terms, however, a knowledgeable, skilled authenticator can provide a credible opinion of the probability of whether an autograph is authentic or not. That is what autograph authentication is all about. The authentication process involves examining the signature to see how it compares to known authentic examples. Key factors used to determine authenticity include consistency, or lack thereof, in various characteristics of the signature, such as; letter formation, size, slant, spacing, style, pen pressure, and fluency. While everyone writes their name a little differently each time, a skilled authenticator can differentiate that from a non-authentic signature. Other factors that play a role in authentication are: (1) knowledge of how a signature has changed over time; (2) the age of the ink; (3) knowing where on an item a subject is inclined to sign it; and (4) the type of item signed relative to the subject�s date of death. There are both formal and informal methods - or formats - of providing authentication services. In short, the informal version consists of relaying an authenticity opinion via e-mail, phone call, etc, after the authenticator views the item or a scan of the item. The formal type of authentication consists of a tangible certification of the item. FHA provides both types. For details on FHA�s policies for both of these categories, click on the SERVICES link. In the formal type of authentication, there are a number of different procedures currently being used in this industry, including; Letter of Authenticity, Certificate of Authenticity, Placing Stickers on Items, Encapsulation, and Spraying Ink on the Item. For details on FHA�s feelings about Stickers, Encapsulation, Certificates, etc., see the FAQ�s page. FHA believes that the Letter of Authenticity, which states the authentication finding and includes a photo of the item and autograph, is the best form of authentication documentation. FHA also believes that any other form of formal authentication is unnecessary - and in some cases - counterproductive - and should not be utilized. FHA believes that no item should be defaced in any way and that people should be able to fully enjoy their autographs by having the option to handle them. Whenever one seeks to have an autograph authenticated, FHA believes they should not base their selection strictly on name recognition. They should find out what type of authenticator they are dealing with. All autograph authenticators are NOT the same in terms of background, experience, qualifications, and credibility. An authenticator�s credibility is not something that should be awarded or appointed, it should be earned. There are four different types of authenticators; FIRST-HAND, SPECIALISTS, EXEMPLARS, and FORENSIC. Following is a description of each. 1. FIRST-HAND those who base their authentication opinions on First-Hand experience. 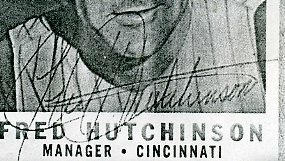 This type of authenticator has a unique instinct with autographs, and is so highly skilled that authentication opinions can often be formed without even having to refer to exemplars. But when exemplars are used, they are from signatures that they KNOW are authentic. There are very few authenticators that fall into this category, and most that do have First-Hand experience from the 1980�s and beyond. As for the 1960�s and 1970�s eras, there were not that many First-Hander�s back then. Most who were have long since discontinued. Of those who have remained active to some degree in the autograph field, most have no interest in becoming involved in the authentication industry. The increase in the popularity of autograph collecting over the last 20 years has resulted in some very talented people with extensive First-Hand experience from that time period, not currently in the business who would be a great asset to the industry. FHA believes that First-Hand authenticators provide a unique level of knowledge, experience, skill and credibility that other types of authenticators are unable to provide, and, therefore, should be considered the first choice when deciding which firm to select. In other words, if one has a choice between an authenticator who has actually met and obtained autographs from a subject, and one who hasn�t, it�s a no-brainer. 2. SPECIALISTS those who specialize in one particular name or a small group of names. Like with First-Hand, there are not many authenticators who fall into this category. Those that do may or may not have first-hand experience. What most do have is extensive examples from reliable, verifiable sources, from which to base their opinions. Most of them have spent many years perfecting their craft, and being able to focus on a very small number of names, are able to authenticate at an extremely high rate of accuracy. 3. EXEMPLARS those who base their authentication opinions on exemplars, or copies of what they believe to be authentic signatures that they have compiled from any number of sources. The majority of authenticators fall into this category. Most of them had some experience with autographs prior to becoming an authenticator, usually as a collector or dealer. Some of these people will authenticate virtually any name, from any field, from any time period. Some people feel that there are some quality Exemplars authenticators, who, while not true Specialists, are very effective in a particular area. But when one engages in jack-of-all-trades authentication, it raises serious credibility questions. FHA believes the Exemplars authenticator can be an asset to the industry, but that some type of standards for authentication be should implemented - otherwise, anyone who has had any level of autograph experience can claim to be an authenticator. With names like George Washington and Christy Mathewson, a First-Hand authenticator is impossible and for other names, a Specialist may not exist. There is a need for someone to be able to authenticate in these types of cases, so the Exemplars authenticator would be helpful there. However, due to their type of autograph experience, FHA believes they should be considered a secondary choice, and used only when a First-Hand or Specialist is not possible. 4. FORENSIC those with training in forensic handwriting. The training authenticators in this category received is a plus. But most are at a disadvantage due to the level of familiarity with the signatures they authenticate, in comparison with that of other types of authenticators. FHA believes that while authentication is a combination of both art and science - art plays a more significant role - especially with First-Hand and Specialist type authenticators. In other words, knowledge, talent and skill should trump schooling. For example, one could attend a baseball camp and be taught how to hit a baseball. But that does not mean at the conclusion of the camp, that person can then hit a baseball better than someone with more talent that did not attend the camp. FHA believes that science becomes more relevant with the Exemplar and Forensic type authenticators. Several scandals involving forensic authenticators passing questionable material has harmed the reputation of those in this category. There are several ways that authentication mistakes can occur. The most common are: (1) being fooled by a well-executed forgery; (2) misjudging an authentic signature which contains a deviation from the norm; (3) not recognizing a mechanically produced signature; and (4) authenticating a signature without possessing the knowledge or expertise for that name. Given that all authenticators are human and not infallible, even the best of authenticators is capable of being fooled by a time or two by the first two examples, and maybe even the third. But missing one because of a lack of familiarity or knowledge with a signature is inexcusable. Unfortunately, it happens all too often. When that occurs, it raises serious credibility questions - if they were wrong on that one, how can one feel confident they got the next one right? The autograph authentication industry is relatively new and still in its� infancy, to a degree. It wasn�t that long ago that authentication services didn�t even exist. While non-authentic signatures have always been around to some degree, the problem of forgeries accelerated in the 1990�s. So, when authentication services first began to spring up, they filled a need that had existed for a while. Collectively, these firms did an admirable job of getting the authentication field off the ground and they should be commended for that. But somehow, the authentication field evolved into one that has become dominated by the concept of One-Stop Shopping. In One-Stop-Shopping authentication, vast amounts of names from vast amounts of fields from vast time periods are authenticated by one individual, or company. FHA�s familiarity with other authentication service firms is more on a collective than individual basis. FHA believes there may be some talented, knowledgeable people within this group, some of whom may be highly skilled within a particular category or time period. However, FHA also believes that the concept of One-Stop-Shopping authentication - while convenient - and which at one time might have served a useful purpose - does not provide for the best possible authentication for each name. FHA believes that trying to cover too much ground can result in someone authenticating names they are not truly qualified to authenticate - which is a major reason why mistakes occur. No one person or two people, etc., can be an expert on the signature of every celebrity who ever walked the planet. FHA believes that much improvement is needed in the authentication field and that specialization is what it needs to take it to the next level - to increase accuracy and reduce mistakes. It has become acceptable among some that one company or two companies can render an authentication on virtually any notable who ever lived. FHA believes that those who help perpetrate that philosophy are not serving the best interests of the collecting community - and that applies equally to sellers and buyers of autographed material. FHA understands the appeal that the convenience for a seller to use one firm to authenticate all of their signatures provides. But FHA also believes that they have an obligation to their customers to provide the best possible authentication for each name. As for buyers, they have a role, too, as those who buy into the One-Stop-Shopping concept could be setting themselves up for a fall. On many occasions, FHA has seen what it believes are non-authentic autographs passed as authentic by One-Stop-Shopping authentication firms. So buyers need to become more vocal in demanding specialization in authentication. FHA was formed to lead the way of specialization in the authentication field and hopes to see other qualified candidates follow in their footsteps. The more specialized this field can get, the better. In addition to specialization, FHA believes another area of authentication that needs improvement is accountability. Some authentication companies offer services in which the name of the individual who did the authentication is unknown. How can an authentication be deemed credible when the name of the individual who did the authentication - as well as their qualifications to authenticate that name are unknown? FHA believes that every authentication should come with the name of the authenticator - and that their authentication credentials be made available. Companies don�t do authentications, people do. Another factor to keep in mind is, like in any other field, some authenticators are simply better than others. Authentication skill is an often overlooked element, in part because it is difficult to quantify. Finally, the level of experience an authenticator has with a particular name greatly affects the accuracy and credibility of their authentication.